A knife-wielding man has been arrested after being cornered by the PSNI in Lurgan last night. 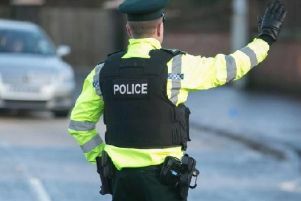 Police said the man in his 20s was spotted running around with a knife in the Victoria Street area of north Lurgan. The PSNI tasked a helicopter to search for the man who was discovered, cornered and arrested for possession of an offensive weapon. Police added there had been a bench warrant out for his arrest and he is currently in custody. A PSNI spokesperson said: “This was all made possible due to some really accurate information from members of the public, who gave great descriptions, directions of travel and made it quite a simple task for the Chopper Coppers to find him. Great work by all, starting again with you - the public.